When I was a kid (and to this day), I never cared much for Rice Krispies. They were better in the overly sweet, marshmallow form that graced many of my friends’ lunches, but I’d have preferred cookies or pudding any day. 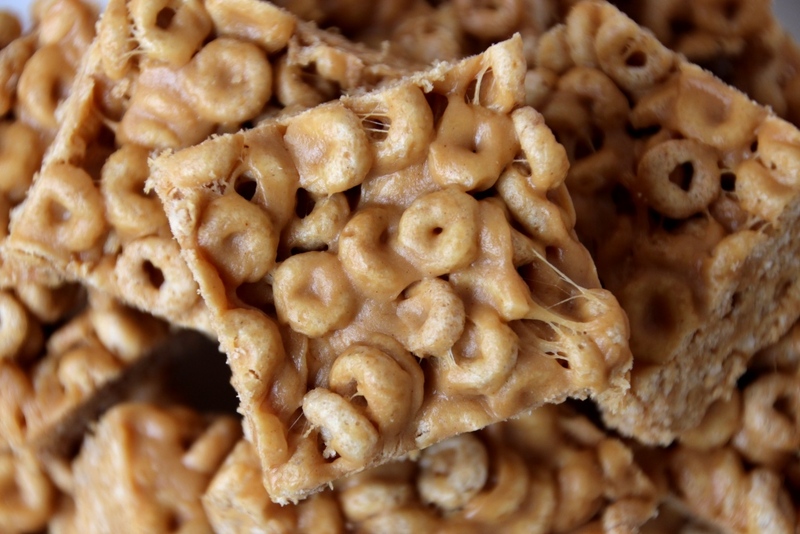 Instead, my mom often made what we called Cheerio treats: the peanut butter and Cheerios cousin of Rice Krispies Treats. 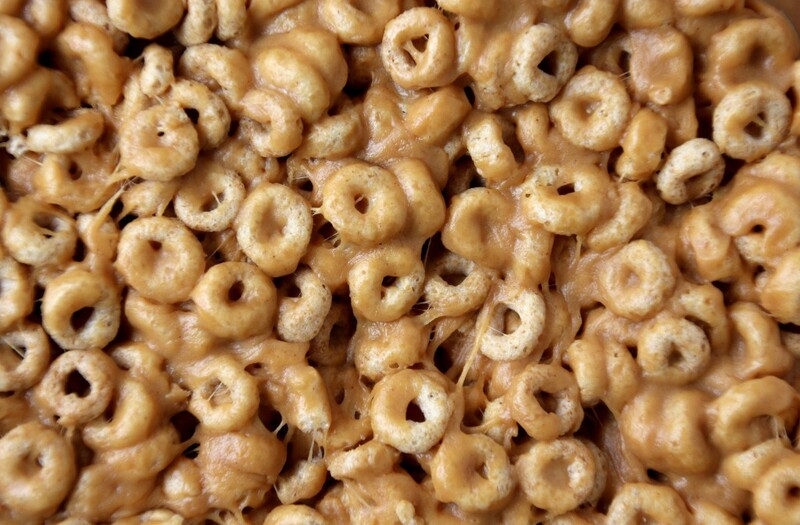 As a household of peanut butter fanatics and Cheerio eaters, these were always a big hit. 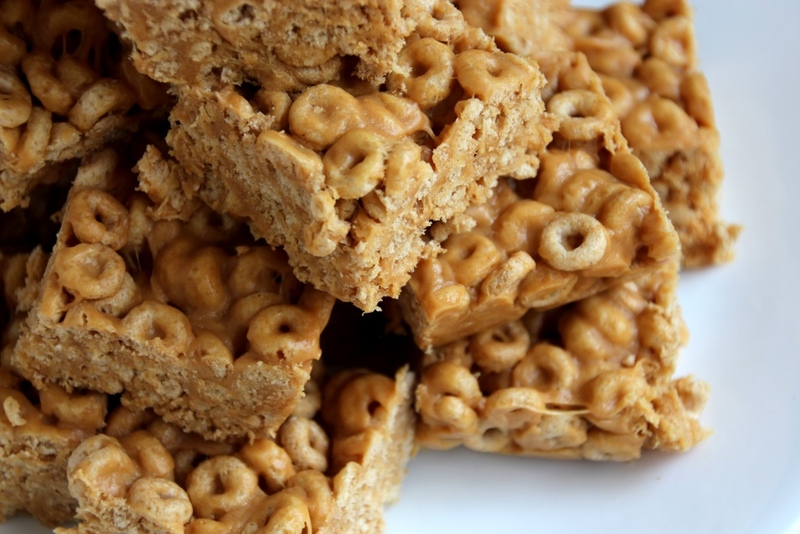 A bit crunchier than a normal Rice Krispies treat, but with the added flavor of peanut butter, these continue to be one of my favorite easy snacks. Since they are made in the microwave, they are perfect for hot days when you don’t want to heat up the oven. Even better, they only take about 15 minutes to come together, making them a great go-to recipe when you’re in need of a quick treat. Just make sure you always have marshmallows in the cupboard and you’ll be ready to go at a moment’s notice. I nearly always make them our traditional way, with creamy peanut butter and plain Cheerios, but feel free to mix it up however you like. I’ve given some suggestions after the recipe if you’re looking for inspiration. Whether you go with the original or kick it up a notch, these are a wonderful treat. Lightly butter an 8×8 baking dish. In a large, microwave safe bowl, heat the butter on high for 45 seconds, or until melted. Add marshmallows and peanut butter and stir. Heat in microwave for 45 seconds, stir, heat again for 45 seconds, and stir until mixture comes together with little to no streaking. Add cereal, stirring until combined. Mixture will be stiff. After it cools slightly, you may want to use your hands to mix it further. Press into prepared baking dish and allow to cool. Cut into desired pieces (I usually do 12 or 16) and serve. Store on the counter in an airtight container. 1 If, you prefer, you can heat the mixture on the stove over medium heat instead of using the microwave. 2 I like them gooey so I only use 3 cups of cereal; my mom uses 5 cups. The more you use the more important it is to make sure everything is combined really well so it all sticks together.